My kids have great teachers and even though gift-giving is not an expectation I still want them to know that they are having a positive impact in my children’s lives. Here’s the thing: While teachers really appreciate the spirit behind end-of-year gifts, they really don’t have the storage space for yet another mug. So, last Christmas I “whisked” up four super easy Teacher’s gift that not only were a huge success because they were different but they are useful too! So here we are..the beginning of December and my mind has turned to what I will be making this year.I took a second look at this wonderful teacher’s gift that I made last year but realized we have a teeny tiny problem. My daughter has the same teacher my son had last year. 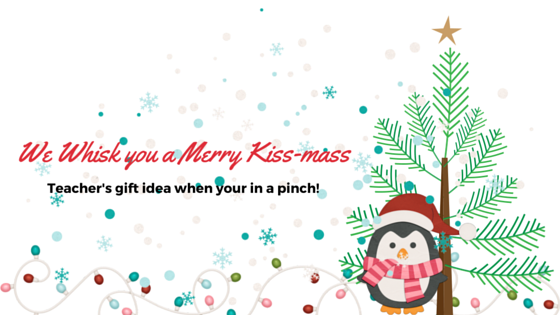 I doubt this one gift idea will make a second appearance but it’s too good not to share! I’m still going to make something but the pinterest hunt is on. Do you make Teacher’s gifts? « We have a winner!! what a cute and frugal idea! I love this gift because it’s practical too! This is such an adorable idea. I love that it is low cost but looks super cute. That's inexpensive enough that it could be given to many people! This is such a great idea for a gift! Fantastic idea, I'm SO stealing this! What a cute gift idea. I love the play on words. I am sure your daughter's teacher will not mind seeing your cute gift for the second time. Who doesn't love Hershey kisses. This is adorable! I'm definitely doing this for my mom and our daycare teachers! This is so creative and inexpensive. Yet, certainly not cheap! Thank you for the creative idea! Love this gift! I know that any teacher or any one else for that matter would love it also! Awww, such a cute idea! I can't wait until our little one goes off to school (two more years) so we can make things like this for her teachers. This is a super clever idea! Thanks for showing how you did it, might make it perfect for teachers in Charlottes class. What fun idea. I may just have to use this. These are so cute! 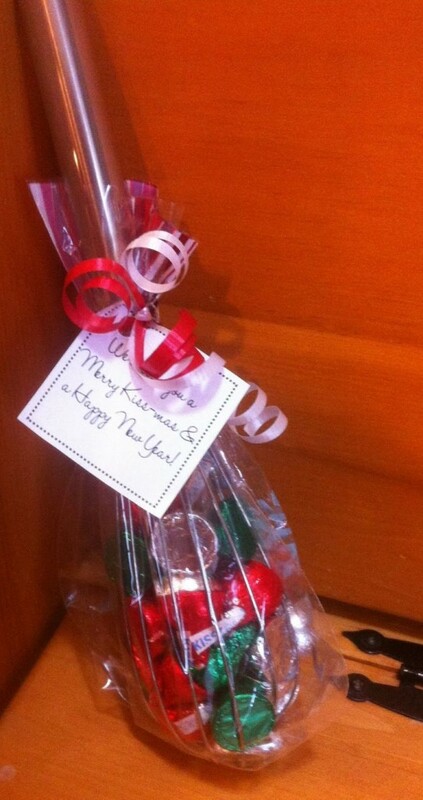 I made a gift “basket” in a mixing bowl with lots of cooking mixes for one of my son's teachers this year. This is such an adorable gift idea! I have a few on my list who would love this! Very cute idea! Sharing with my friends ~ everyone is always looking for something unique for the teachers. i seriously LOVE this gift. I actually GOT one of these last Christmas and I adore it still! Well, I ate the chocolate and use the wisk, but I love the idea. Perfect white elephant or teachers gift! Got to love it! how adorable– i love this gift!!!! This is a great idea! I sent it to my friend, who is a teacher in CT, and he thought it's much better than another coffee mug! I love this idea, and can think of quite a few people to give this to. Supercute! This time of year it is always hard to figure out what to get the teacher! Wow, what a totally cute idea! I am going to use this for my son's daycare teachers! those are totally cute!! and yes no one needs more mugs!